Last week Charlie and I were walking along Southbank when I saw three women pushing strollers walking towards us. Three mums, three strollers and three little girls. One of the mothers was wearing a T shirt that said “The Future is Female”. They were talking animatedly and laughing at one another and they looked the image of empowerment, friendship and feminism. I smiled at this girl gang and thought how great it is that they are raising daughters in this era of renewed attitudes and watershed moments. Where there feels a shift, a revolution of sorts. I also thought how lucky they are to get to buy girls clothes from the Seed Kids range. My mind is often a wild mess of thoughts when it comes to motherhood and this includes what kind of person I hope to raise. I want my son to be emotionally intelligent, resilient and happy. I want him to be compassionate. I want to raise a feminist son who is respectful to all, not because that’s what the rules are but because it is his nature, it is the core of his self. I want to expose him to all that is good in the world and protect him from all that is wrong. I want to teach him to ask questions, to be curious and accepting and tolerant. I want the narrative of his life to be because it is the path he chose it to be and not because some crazy societal expectation. I want him to be kind. Right now I also want him to eat more vegetables but worrying about his antipathy towards green food is nothing in comparison to worrying if he will be a kind and happy. I thought back to the “Future is Female” T Shirt and so now I’m confused. I look forward to the day that it won’t matter what the T shirt says. 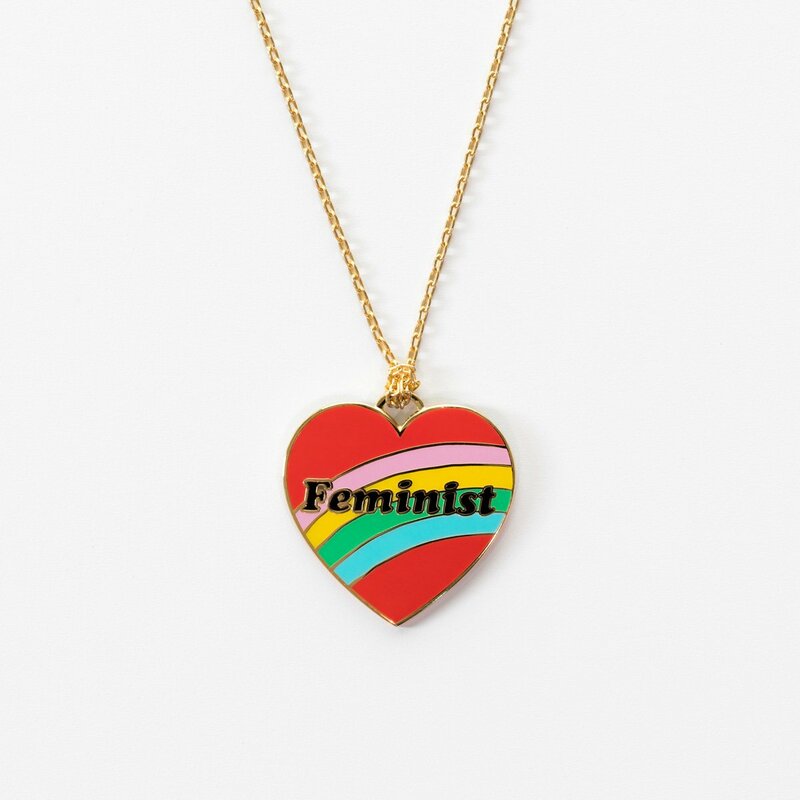 I don’t want a world without feminism and there is so much more to feminism beyond hashtags, necklaces and platitudes. I know that my son will benefit from feminism. What we are advocating for means that in years to come he will be able to have flexibility at work without the expectation of being the breadwinner and that leaving work to do school pick up (assuming he wants and has children) will have no impact on how he is perceived at the office (assuming he wants and has a career that involves an office). I want him to want to be a hands on dad in a time when being one doesn’t come with a round of applause. My point is I want him to grow up without limitations and restrictions around gender stereotypes and feminism allows this. Last week MM was called upon to relocate a spider that so kindly thought to shower with me. That doesn’t mean I’m a bad feminist, it just means I don’t like spiders, in particular those that are the size of a saucer. Charlie sees both of his parents going to work and sharing household responsibilities and that the roles we have at home are no better, just different. Notwithstanding the odd hairy spider, he sees parity. He also sees the way his dad lovingly and respectfully treats his mum and that is far more importantly than who looks after pest control. The “Future is Female” T Shirt is empowering for women but it should not throw shade over the decent men. Because those decent men (not the sexist, anti feminist, idiots, abusers and all round jerks) don’t know if they should open the door for a women or not. I fully expect my son to treat women with respect and this includes opening doors not because it’s a “man’s job” but because he has been raised to be good and to be kind. I hope that the woman he opens the door for doesn’t feel patronised but simply sees it as an act of courtesy. I hope he opens doors for men. It’s exciting and it’s extraordinary and it’s about time that the future is also female, but let’s also remember that what is more important is that the future is where equality transcends gender. I have to admit I have a boy and girl and as a parent struggle with the mundanes of raising children – eating vegies, being a good person etc. But … when I see so much stuff on girls being powerful I hope we never overshoot the message. I need to remind my daughter her brother has a right to his opinion and his say on matters and is also a member of the family/ household. She needs to be respectful as we all do. I do worry about my son growing up in today’s world. I fear many young men will either retreat or retaliate due to extreme views being projected. Please don’t get me wrong I so believe in women being powerful but we need to use this power wisely. Of course I talked to him about how it’s more an equity thing. That women are fighting for a world in which we are finally brought to the table as equal and right now the message on these shirts is about remembering that we deserve a future in which females are just as respected and powerful. But…I am raising a son (6) too and I admit I started to wonder about what that might say to him. I want him to be a feminist (as every human should be) so I think he’ll understand if I do indeed end up with that top, but you’re so right. I want to live in a world where we don’t feel the need to wear these merchandised items to make a statement. I want to teach both of my children to be kind and respectful to all and I too want it to transcend past a conversation about gender. Hello, I’m really glad that my post resonated and I too have a supportive husband but I know for sure he would say something similar. We talk a lot about gender and equality and I’m really passionate about it but I’m also mindful that he is one of the “good guys” and then as you know, raising a little boy in this era presents its own challenges. Thanks so much for your comments. I have 2 sons and the oldest has just started high school. From what he tells me the girls do indeed think that girls are strong, confident and the future is theirs. They however have not been taught to respect boys but that boys must respect them only. For example if they play soccer together it is totally fine for the girls to physically push the boys but they go crying to the teacher if the boy pushes them. So the war of the sexes continues and it is still as divided as ever. Girls are not better than boys. And boys are not better than girls. Are they different? In some ways yes, but in most ways not much. I wouldn’t push the feminist card on him too much, focus on the equality angle because he will need to know he is not lesser because he is not a girl! Wow, that’s interesting. My son is only in kindy so we have all of this in front of us. Of course, boys and girls are different in some ways and I think we need to celebrate this rather than see it as a negative (which many do). We need a “The future is equality” slogan shirt. The slogan means the future will be a better time for women. As in, a world where equality is achieved. It doesn’t mean female supremacy. It’s a problematic slogan more because it’s transexclusionary rather than any possible hurt male feelings IMO. If feminism isn’t intersectional, it’s not worth much! Thanks for your comment. I admit I had always thought the statement “The future is female” did sound supreme but you have made me look at as it just being a better future – which obviously is only a good thing.